« New clues to fate of lost Roanoke colony? 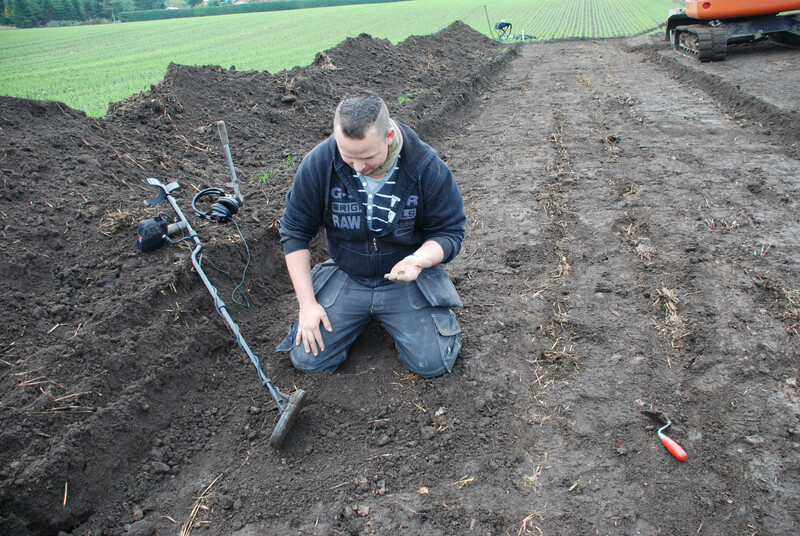 Metal detectorist Morten Kris Nielsen was exploring a farmer’s field near Spentrup on the Danish peninsula of Jutland when he found a gold fibula, a brooch used to fasten a cloak. Without even cleaning it, Nielsen brought it directly to archaeologist Benita Clemmensen at the Museum of Jutland. He was sure there was more where that came from, so that same day he returned to the find site and unearthed a second piece of the fibula and two crescent-shaped gold pendants with stylized birds’ heads at each end of the crescents. 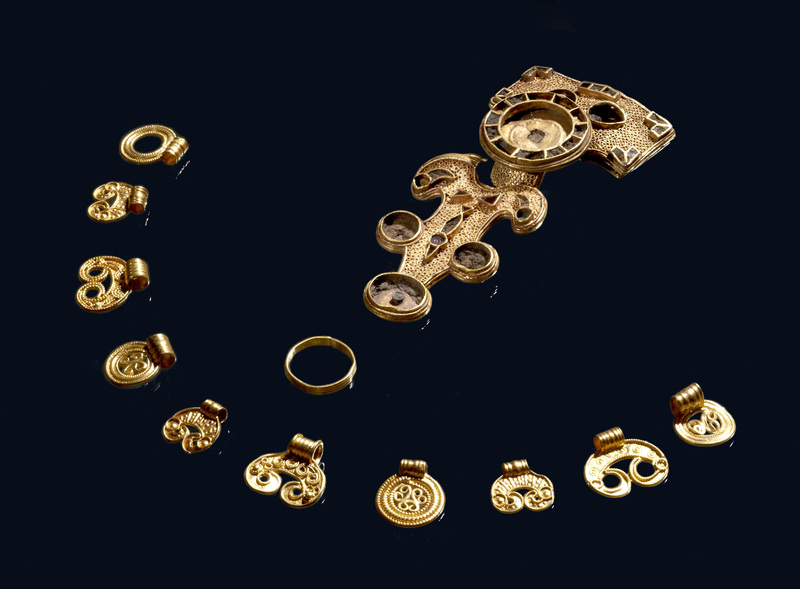 Museum archaeologists then excavated the spot and found another eight gold pendants, four of them in bird patterns, and a gold ring. The archaeologists found that this small but extremely rare and valuable hoard was deposited in a bog, probably as a religious sacrifice, in the early 6th century A.D. Because Nielsen was so conscientious in reporting his finds without so much as rinsing them off, museum experts were able to find traces of dissolved glass in some of the many intricate channels of the fibula. There are surviving red semi-precious stones thought to be garnets on the piece, and the remains of a yellowish-green mass which may be glass. The total gold weight of the hoard is 35 grams which is relatively modest, but the quality of the pieces is thoroughly immodest. The fibula is eight centimeters (just over three inches) long and is made out of a gold sheet wrapped around a clay core. The surface is festooned in tiny gold circles. Even tinier beads of gold like strands of pearls follow the edge of every section of the piece. 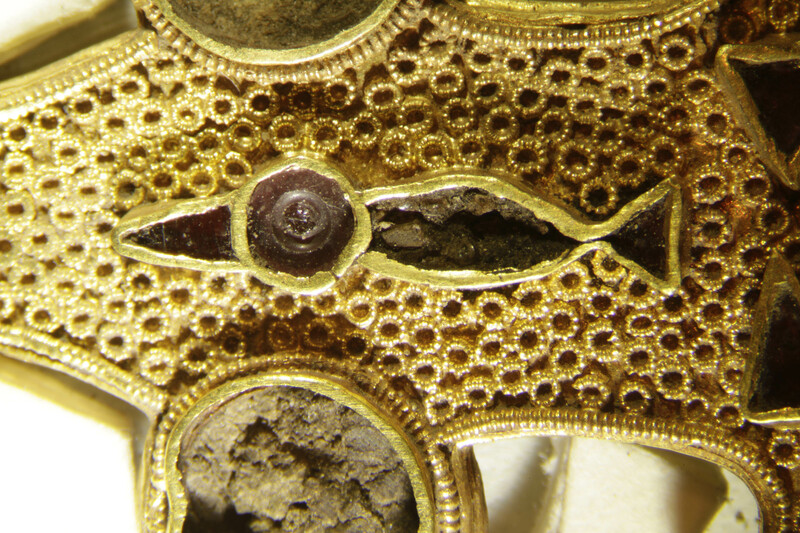 In the second fragment of the fibula — a circle with stones or glass between spokes — there’s a gold waffle pattern underneath the stone settings that is reminiscent of some of the garnet pieces from the Staffordshire Hoard (see this hilt fitting, for instance). 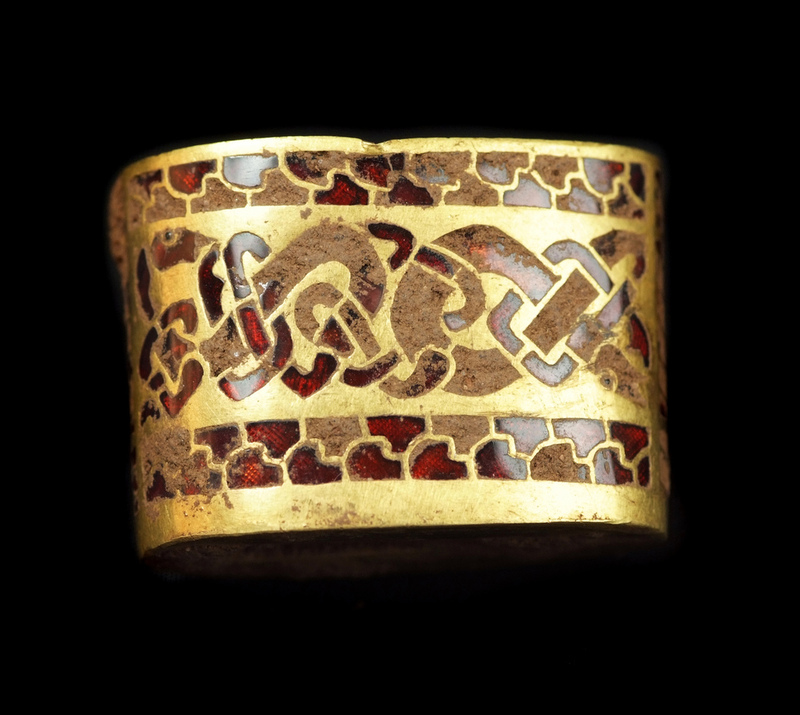 On the bottom section of the buckle is a bird, outlined in gold with the tail, head, body and beak formed by inset red stones. The eye of the bird is cut into the middle of the head’s stone. Archaeologists think the fibula’s bird and the bird heads on six of the pendants probably represent ravens, important figures in Norse mythology (Odin had a pair named Huginn and Muninn who brought him news of the world every day) that are common motifs on jewelry from this period and later. 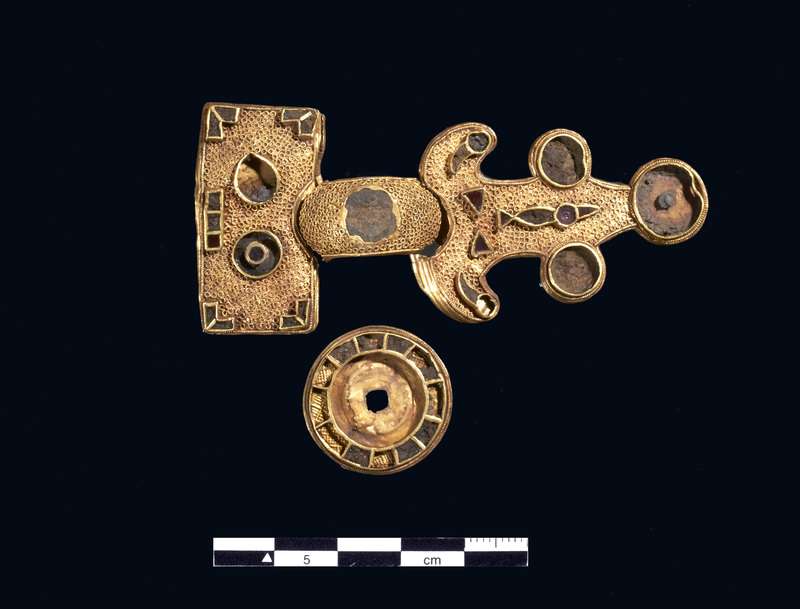 According to National Museum of Denmark archaeologist Peter Vang Petersen, only a few large gold fibulae of this type have been found in Denmark. They were made locally out of Roman gold with semi-precious stones imported from Scandinavia and Central Europe. This was high craftsmanship. The woman whose cloak this held together had to have been immensely wealthy and important, and the fact that she was able to sacrifice such riches suggests that she was wealthy beyond the mean of the Spentrup area which has never seen a treasure find like this before. As for why she might have felt compelled to sacrifice such valuable pieces, it’s because the Norse gods preferred gold, not surprisingly, and when circumstances were grim, that was the kind of sacrifice you’d make. This period, the early sixth century, in the middle of the turbulent Migration Period, saw a great many gold votive deposits. On top of the political upheaval and mass movement of populations, the first half of the sixth century saw a climactic disruption that is recorded by historians from the Byzantine Empire to China to the Middle East to Europe. Probably as the result of a volcanic eruption, in 535-6 there was no summer and the sun’s rays were wan like during an eclipse. Famine, crop failure, freezing rivers followed, an unending winter that was a sure sign to the Norse that Ragnarok, the apocalyptic Twilight of the Gods, was nigh. The Mosegård Church Hoard, as the gold has been dubbed because of its find site near the church, is on display at the Museum of East Jutland in Randers until December 19th, 2013, after which it will move to the National Museum of Denmark in Copenhagen where it will be part of its Treasure Trove exhibition opening in January. This entry was posted on Thursday, December 12th, 2013 at 9:56 PM	and is filed under Ancient, Treasures. You can follow any responses to this entry through the RSS 2.0 feed. You can skip to the end and leave a response. Pinging is currently not allowed. Liv, what are the treasure trove rules in Denmark? Any compensation for this remarkably conscientious finder? From what I’ve read, there is a reward system for finders of artifacts that the National Museum deems to be of historical significance and therefore wants to keep. (If they don’t want to keep it, the finder gets to.) The amount of the reward is determined by museum experts, but there has been some grumbling that the valuation criteria are not transparent and the rewards tend to be considerably lower than baseline market value. I doubt this fine fellow would be concerned about that, though. He seems to be very focused on archaeological value, bless his heart. The ‘pendants’ are super tiny! Getting all that detail onto something so small must have been a fair challenge.